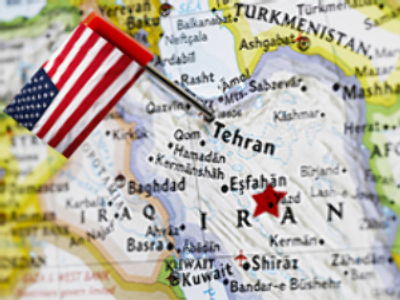 US to invade Iran any day now? A few weeks ago the Russian newspaper Izvestia, a well-known and authoritive daily published nationwide and abroad, came forward with something that would have been looked upon as a conspiracy theory if published by a tabloid. The paper suggested that by attacking South Ossetia, the Georgian President Mikhail Saakashvili had badly damaged a planned U.S. military operation against Iran. In the newspaper's opinion Georgia was supposed to play the role of another “unsinkable aircraft carrier” for the U.S., i.e. an operational and tactical base for U.S.
aircraft that would be making bombing raids into Iran. Something akin to what Thailand was in the Vietnam war. Thailand certainly benefited from the arrangement, and Georgia would have too, insists the paper, if its President hadn't put his ambitions above the US national interest and ended up beaten, disarmed, chewing on his neckties and totally incapable of providing whatever the U.S. needs from him. That's why, according to Izvestia in yet another article on the matter, the U.S. response to the Russian retaliation was harsh in words but very mild in action. The latest on the issue suggests that Mikhail Saakashvili may be replaced any day now by direct order from Washington. Having read the story in Izvestia I decided to try to figure out the extent of improbability and impossibility of the assumptions. As I was doing that, I remembered that early in August CNN had started showing U.S. generals who cried for more troops and hardware for Afghanistan which, in their opinion, was rapidly becoming a more intensive conflict than Iraq. Shortly after that, a phone call came from a college friend who had just come back from Kandahar in Afghanistan, where he had seen American battle tanks being unloaded from a Ukrainian-registered Antonov-124 “Ruslan”, the heaviest and largest cargo airplane in the world. The friend asked if I had any idea what tanks would be good for in Afghanistan, and I said I didn't. It's an established fact from the Soviet war in Afghanistan that tanks are no good for most of the country's mountainous territory. They are good for flatlands, and the main body of flat land in the region is right across the border in Iran. Later in August there was another bit of unofficial information from a Russian military source: more than a thousand American tanks and armored vehicles had been shipped to Eastern Afghanistan by Ukrainian “Ruslans” flying in three to five shipments a day, and more flights were expected. Somehow all this, together with the series of articles in Izvestia, the information that all U.S. troops in Afghanistan are going to be reassigned and regrouped under unified command, the arrival of NATO naval ships in the Black Sea, the appointment of a man used to command troops in a combat environment as the new commander of the US Central Command and other bits and pieces. To my total astonishment, when they all fell together the Izvestia story started looking slightly more credible than before. Today the U.S. media reported that there had been a leak from the Pentagon about a secret Presidential order in which President Bush authorized his military (most of which is currently on Afghan soil) to conduct operations in Pakistan without the necessity for informing the Pakistani government. The U.S. military in Afghanistan – or shall we say in the whole region neighboring Iran – is getting a freer hand by the day. And it is getting more and more hardware to play with. Of course it's quite clear now that Georgia has lost its immediate potential as a nearby airfield, but after all, the aircraft carriers in the Gulf are not so far away. Believe me I'm not saying that the U.S. is going to start an all-out war against Iran tomorrow. But aren't there indications that it may happen the day after tomorrow, a month from now, or on any date before the official handover of Presidency in the U.S.? Or, as some suggest, before the election? I'm just asking the questions. But there are some people, like those working for Izvestia, for instance, who answer them with a “yes”.